Warlock Holmes is back. No, not Sherlock, Warlock. If you think about it, what makes more sense; a man who can somehow divine everything from a few clues, or a Warlock who just uses magic to do the same? The Sign of Nine continues the premise that Sir Conan Doyle’s original stories were actually edited to remove all the magic bits. Here are Dr Watson’s real notes; were we see Warlock melting locks and Watson himself smoking bits of an ancient Mummy to harvest its hallucinogenic powers. Sounds a little odd? Try reading the book itself. Who do you call when a man is pinned to a wall by a spear no human could have thrown? What address should you visit when you need to discover the whereabouts of a strange wood beast that is poisoning half human/half greed monster hybrids? The police are not going to know what to do, but the eccentric Warlock Holmes and his steadfast ally, Dr Watson, have gained a reputation of being able solve this type of case with only a tiny amount of destruction and maiming. 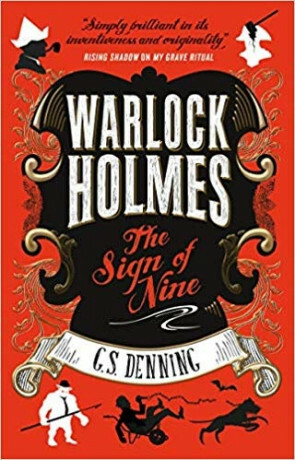 Nine is the fourth outing for G S Denning’s Warlock Holmes and this is an author who is very comfortable at this point with his characters. The book takes the same form as the previous outings by revisiting actual Holmes stories and pushing the supernatural element. The original stories often hinted that the solution may be otherworldly, but Holmes would debunk this. Denning merely suggests that your first instinct may have actually been correct. The characters of Warlock and Watson work so well because Denning respects the original text. It may not feel like it at times, but by sticking to actual Doyle stories any fan of the originals will be able to see how they have been tilted. The Warlock books have always been funny, but Nine may be the most amusing yet. The banter between the characters feels natural. There are moments of absurdity where they discuss the various qualities of the Americans, Australians and Canadians that border on the politically incorrect, but in the mouth of these characters it is hilarious. Denning is able to give the book a sense of time and place. This is Victorian London and all the arrogance that came with it. It may be an absurdist Victorian London, but one that people will recognise. It works because although it is crazy, but there is enough truth in the mix. With several short stories and a novelette included you get a lot of fun for your book. To begin with the adventures appear to be separate, but as the final tale concludes you can see that Denning has linked them altogether. For the genuine crime fan there is a case for them to solve here. Everyone else can just sit back and enjoy the carriage ride. Written on 13th April 2019 by Sam Tyler.